The Sophie Germain hotel is ideally located on the left bank of Paris. 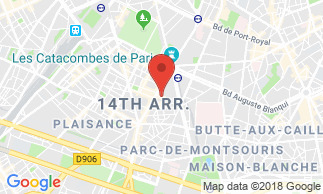 Near Place Denfert- Rochereau, just a few minutes away from Montparnasse train station and the Latin Quarter. The Sophie Germain hotel will be your starting point to discover the beauties of Paris. This 3-star hotel offers 32 quiet and very comfortable rooms, some of them with view onto the villa Adrienne. All 33 rooms have been designed to offer the best comfort and functionnally. The Sophie Germain hotel is located in a small street. All rooms of the hotel are quiet and some of them have the view over the villa Adrienne. The rooms are air conditioned and equipped with a private bathroom with bathtub or shower, WC, complimentary toiletries and hairdryer, safe, minibar, telephone, satellite TV, free WiFi Internet connection and facilities to prepare coffee and tea. The Sophie Germain hotel is located in the 14th district of Paris, near the Denfert-Rochereau Square and very close to the superb market street 'rue Daguerre' and its numerous cafés. Denfert-Rochereau square is a central point in Paris and very close to Montparnasse train station. It gives easy access to the exhibition centres of Villepinte by RER B (35 min) and of Porte de Versailles (15 min). Furthermore, you are very close to Paris' city centre. Hotel Sophie Germain The welcome is perfect, the staff very friendly and smiling. The rooms are clean and spacious. It is a pity that the soundproofing is poor, especially with the elevator directly in front of the room, as the noise is unpleasant. And the hall light that passes through the side of the door is also disadvantageous to the quality of the rooms.